Saps a qué es juga a la Rússia? 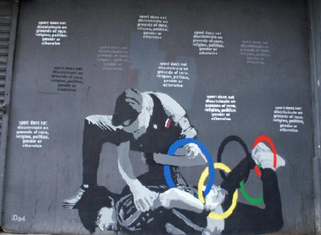 As the 2008 Summer Olympic games got under way in Beijing Amnesty International in Catalunya ran an interesting campaign highlighting the standard of human rights – Saps a qué es juga a la Xina? The 2012 London Summer Olympics attracted some brief Amnesty attention due to the sponsorship links between the Dow Chemical Company and the IOC, and the company’s lack of enthusiasm to help the victims of Bhopal chemical disaster. The 2013 World Athletic Championships in Moscow seemed to raise little interest (and little local popular support looking at the attendances at the Luzhniki stadium). But the Sochi Winter Olympics are most-definitely Putin’s Games and they have attracted lots of attention, bookended by the arrest of Greenpeace activists and Pyotr Pavlensky, a performance artist, nailing himself to Red Square, in a “powerful gesture of absolute despair” and “a manifesto of powerlessness”, and the jailing of Yevgeny Vitishko, a local environmentalist. While it will probably be an unstable restoration, there seems a good chance that an eastward-oriented bloc of nations will be re-established, led by thuggish kleptocracies intent on retaining power and happy to accept subsidies funded by Moscow’s “energy diplomacy” in order to do so. Among the alleged thirty billion dollars’ worth of inflated contracts, self-dealing, kick-backs, crooked tenders and orgiastic waste that have made the Sochi Olympics cost more than all previous winter games put together, what stands out is the sheer brazenness of the whole thing. ‘The Sochi Olympics reveal the dark heart of Putin’s Russia… But nobody is really bothering to hide it. The Kremlin knows it doesn’t matter how much is stolen or siphoned away: Gazprom will still control energy in Europe, Berlin will still appease Putin, Brussels will still roll over, London will still yearn for oligarchs’ money. Kissinger’s realpolitik led to detente with China and Russia. Putin’s seems to leading nowhere, and being dependent on oil and gas, his regime is unlikely to make any effort to deal with climate change. Perhaps – sooner than later – the game will end in tears as the economy continues to stagnate, and unable to deliver prosperity the regimes loses legitimacy. not only is Fascism (and overt military rule) the probable destiny of all Communist societies – especially when their populations are moved to revolt – but Communism is in itself a variant, the most successful variant, of Fascism.